Grand Prix setup at Belle Isle. Photo by Michael Betzold. 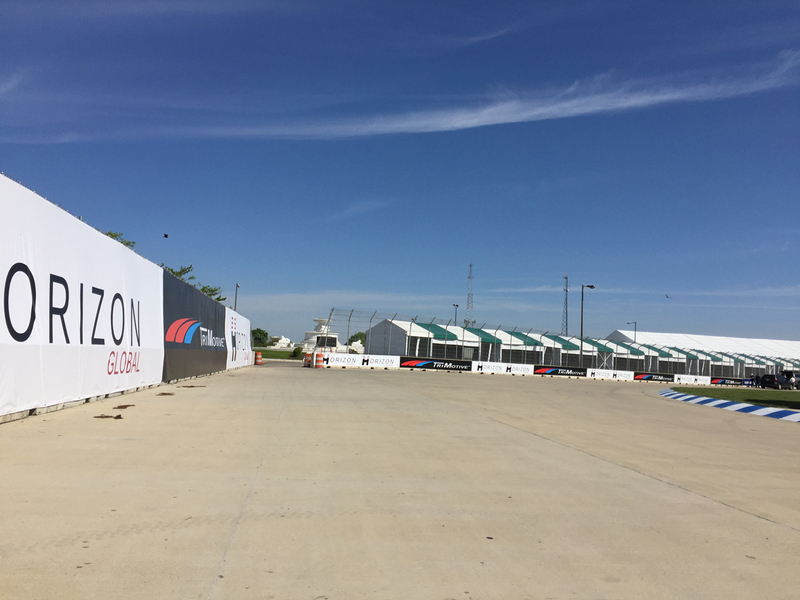 Two-thirds of Detroit residents surveyed by a consulting firm hired by the DNR last year said the Grand Prix is “definitely appropriate” or “somewhat appropriate” for Belle Isle. In the survey, 224 Detroiters were among 700 Michigan residents who were asked about their opinions of the island. The survey results will be presented to the state’s Natural Resources Commission meeting in Gaylord on Thursday. DNR chief Ron Olson said the “statistically significant” survey results provide a basis for continuing the race. “When you have two-thirds that think it’s OK, that’s worth noting,” Olson said. When asked if any result might prompt a change in policy, he said if the favorable rating “fell below 50 percent” there might be cause for concern. Asked if there were any other state parks where annual events occurred that were opposed by one-third of nearby residents, Olson speculated whether there might be people opposed to the Coast Guard Festival at Grand Haven State Park, the annual “Quake on the Lake” hydroplane races at Pontiac Lake State Recreation Area, and to the designated off-road vehicle area at Silver Lake State Park. But he admitted he doesn’t know because no surveys have ever been done. “We do pay attention to anxieties and concerns if we are aware of them,” he said. The state took over the island from the city of Detroit in February 2014. It assumed an existing contract the city held with the race that runs through 2018. The state reportedly can extend that contract at any time without public input. Monday, a security guard was stopping cars, bikes, and pedestrians from entering the west side of Belle Isle. He said, “The state has given us two weeks” to dismantle the bleachers, barricades, viewing stands, and other race structures. By eight a.m. Monday, the guard said he’d let more than 100 construction personnel past his barricades. Yet dismantling work did not appear to be occurring at a fever pitch. In the parking lot opposite the Anna Scripps Whitcomb Conservatory, generators were still running towers of floodlights during broad daylight. Definitely support the race. It’d be nice to see some positive coverage in MCM. I’m a Detroiter, and talk with lots of Detroiters. I don’t know one person who was ever asked by a consulting firm how they felt about the Grand Prix being on Bell Isle. Over 650k people live here. 224 people surveyed? Might as well been 5. We have the Motor City Triathlon on Sunday at the island and the bike course encompasses the whole island. With the concrete barriers in place, if someone needs to crash, they could end up causing a lot of other bikers to be injured. The run portion also goes up the middle of the island where a lot of the barricades are still in place. Also, only 700 residents in a city of hundreds of thousands??? How is that indicative of anything? And why not poll the neighborhoods nearby instead? Usually a study needs 1,000 person sample size to be accurate. No matter what the greater population is. So this is not perfect, but then a lot of stuff you see in the news that the news wants to push, is super low sample size, and everyone seems fine with it, even though you would get kicked out of a statistical analysis class for being such a dope. If they add 300 more people, and get the same result, I can tell you would not be happy. So whats your point ? Polling neighborhoods nearby is not random. Duuuuur. Thats the definition of NIMBY aka not in my back yard. Everyone wants a school close, no one wants it in their back yard, everyone wants trains, no one wants an elevated train going 15 ft from their bedroom window, everyone wants X close by, but not so close it effects them. Thats why you cannot ask people right across the river. That survey was a disaster! It asked “Do you approve of large scale events like the marathon, concerts, and the Grand Prix. “People said “yes” That doesn’t mean they like the Grand Prix!!! It was the worst survey I have ever seen! I agree better wording is each listed individually, but if they said yes, that means yes to all the above. I fully support the races. I was out there all day Saturday and had a great time. The time used to set up was compressed this year, according to organizers anyway. I can’t vouch for that because I attended the race this year instead of volunteering for it so I wasn’t there to see the set up. What should replace the lost revenue used for rebuilding the park should the races stop? If the races go away the cities’ hotels, bars, restaurants and tourist facilities and their employees take a financial hit too. It’s good to keep pressure on the organizers though so that the disruption to the park can be minimized. I like it because the park looks great even back in the bad days, it looks great in ariel shots on tv. Anything on tv that makes detroit look good is awesome. Few things look more awesome than an giant island park in the middle of a river. Not many places have a single park that large, much less an island park that photographs so well from a helicopter. REAL curious of the zip codes of the 700. Even MORE curious of the zips of the 224. Jus’ askin’ ? It does not matter as long as it is random. In fact that its random, is ALL that matters, thats basic statistical analysis 101.